The nicest ranch in "The Highlands" has just hit the market, and it has every upgrade you can imagine! 3 B.R. 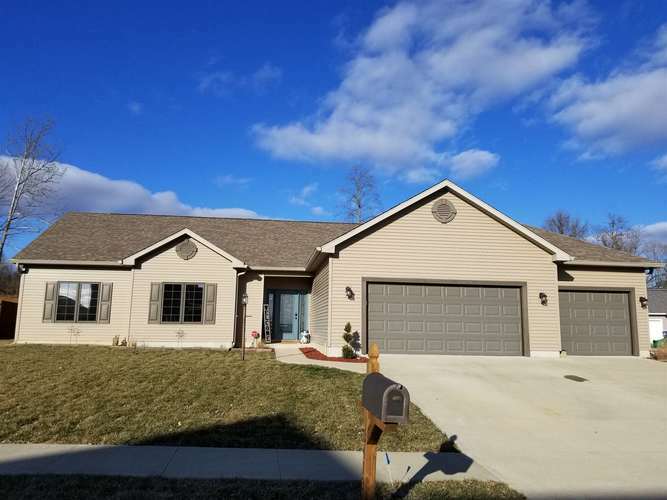 - 2 Bath home has a 3 car garage, all 9 ft. ceilings, vaulted Great Room/Kitchen with cherry cabinets, granite counters, expansive tile floor, custom lighting, stainless steel appliances, and a center island also topped with granite. Large laundry, also adjoins the kitchen with custom shelving and top-of-the line washer/dryer. The hi-effiviency windows have all been treated with a bronzed, mirrored coating for UV control. Large master suite with trey ceiling, and a spacious bath with double vanities, walk-in close, and glassed shower with brushed bronze shower head. Rounded drywall corners, upgraded 12-2 wiring, and a fully finished 800 sq. ft. garage! Fenced backyard has pergola over sculptured concrete patio that's ideal for grilling and outdoor entertaining. This is a "must see" in the newest part of the neighborhood. Simply spectacular! BHS-South School District. Directions:S Rogers Street, right on Gordon Pike, right on Wickens. Go to end of street, turn right on Glasgow. Home is on the left. Listing provided courtesy of Bill Howard Real Estate.